FAYETTEVILLE (March 4, 2016) – With North Carolina’s public universities lagging their peers in faculty compensation, the UNC Board of Governors has decided to make competitive pay a top priority in the upcoming legislative session. When the NC General Assembly reconvenes next month, board members and President Margaret Spellings will make the case for a $58 million increase in compensation that would let campus leaders reward top talent and give a long‐awaited raise to many faculty and staff. 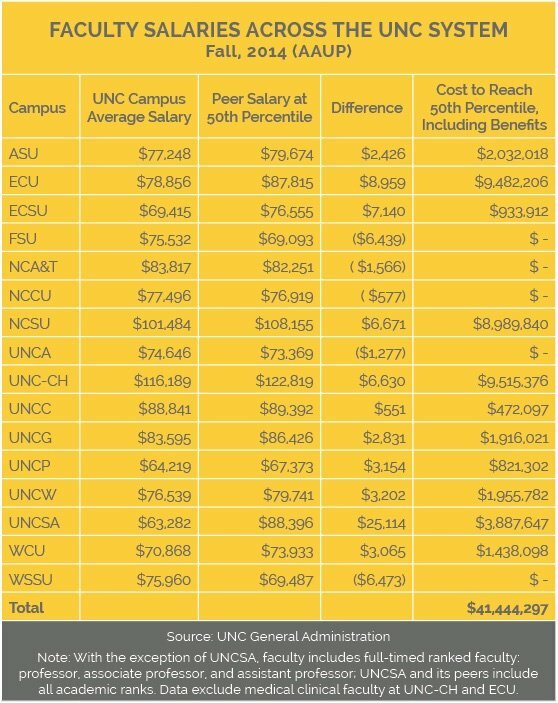 Though state leaders like to say the UNC System is the best public university system in the country, a study released this week found that average faculty salaries at 11 out of 16 state universities fall below the 50th percentile when compared with their peer institutions. The study found it would take a raise of roughly 6% at UNC-Chapel Hill and NC State University, the system’s flagship institutions, just to reach the modest goal of reaching the 50th percentile. Yet perhaps out of pragmatism, the system is preparing to ask state legislators for a 2% raise for faculty. The data make the case for a raise of substantially more than 2% – especially when other institutions can be expected to continue raising faculty pay. Legislators have granted university faculty one raise in seven years. Meanwhile, 76% of the faculty members across the system who received offers from other institutions from 2012-14 accepted those offers and left, often taking millions in grant dollars with them. This year faculty received a $750 bonus, which did nothing to increase base pay. University leaders will also ask legislators for $3 million to bolster the system’s Faculty Recruitment and Retention Fund, which has been depleted as campuses worked to fend off poaching of nationally‐recognized teachers and researchers. “[Faculty] need to have the perception that this system understands what they do, and is committed to it,” said Smith. Unfortunately, the sentiment was not unanimous. Board member Marty Kotis of Greensboro voiced skepticism about seeking additional taxpayer dollars for salaries, arguing that campuses can identify other funds to boost pay. Several chancellors spoke later about difficulties keeping high‐performing professors when other universities are making strategic investments and working hard to recruit. Junius Gonzales, the system’s vice president for academic affairs, said that other universities know which states have fallen behind in pay, and they “go shopping” in those targeted areas. Years of stagnant state funding have left North Carolina’s public universities vulnerable. We need to reward the folks who teach our kids – at every level. If we don’t, we will continue to lose our state’s best teachers and researchers. It is not just faculty at the state universities, though I am sympathetic. It is ALL state employees who are falling behind comparable job pay in other public and private sectors. Another article insensitive to the 7%-8% rise in tuition and college costs every year for decades that causes parents and students to go deep in debt, and where 70% of the increased costs are due to unjustified increases in administration, and where the value of the salaries from the degrees given have not kept pace. Bureaucrats use this flawed rationalization in every state in a case of one-upmanship. The current increases are multiples of cost of living and income increases and is already unsustainable and unaffordable for many. If you want to be fair, then lead the charge for holding the line in tuition increases. Or cut unnecessary administration and use that money to give professors raises. I love NC and NC schools, but it is the students’ current and future finances that are the issue. This analysis is incomplete without specific data for each campus showing what percentage of undergraduate instruction is performed by the faculty covered here compared to percentage performed by adjunct faculty. Then compare salaries of both adjunct and full time faculty. Many UNC faculty did get pay raises! Don’t let them kid you. Other state workers did not though. A confidential envelope was passed around to department heads from the dean’s office just before year’s end, followed by a letter in another secret envelope outlining their raise! How about that for equity! There are different benefits for faculty, also. How is that fair? I wonder what benefit package Ms. Spellings is getting? Kind of like the one Ms. Folt received I’m sure. I expect she will soon give herself a $50,000 raise I guess, too. It is nothing short of a plantation mentality at UNC! The EPA and SPA classification is clear evidence of this! The haves and have-nots, chiefs and Indians, master and slave. All employees at UNC should have Equal Benefits. Some faculty are getting huge percentages of their salaries matched by the university in their retirement accounts, as much as 18-20%. That is clearly unfair equity of benefits. At a private college nearby, benefits had to be changed to offer equal benefits to ALL employees, as some employees were being offered free tuition benefits for their family members while others were not. Just wanted to point out that these numbers exclude contingent faculty. I’m not sure why they’re constantly left out of the discussion as they currently make up more than half of all UNC faculty.